My experience with the music of Holland Phillips is Circles of 8 and then I went on another journey with Under a Second Moon. Now another year has already passed and Leaning Toward Home will be arriving within a matter of days. I get off easy calling Holland’s music contemporary instrumental. It is hard to define so that is the best tag to put on it. It is a fusion of sounds. You can call it whatever you want but I do highly recommend giving it all a good listen. All the music was composed and performed by Holland. The man is a magician on the keyboards and he generates enough instrumentation to sound like an entire band on this recording. I like being challenged with music, in a sense that it makes me think, it allows me my own space inside my head and in my soul. That is the complete circle for this listener. It takes a special kind of music to allow that to happen. Holland could not have said it better when he referred to this production as magic. To me, that is the beauty and perfection of music, more importantly, instrumental music that has the ability to sweep you away to an altered consciousness, a better state of mind, body, and spirit. The title track said it all for me. It has that magical and mystical atmosphere that takes you right in and hangs on until the track fades away. There are so many sounds, consistencies, and bright colors to be discovered on “Leaning Toward Home.” In fact, the entire recording offers so much diversity in sound that each track brings another feeling and atmosphere to light, it is like watching an ever-changing colorful lava lamp except this is translated to sounds, vibrations, something that is more meaningful and spiritual. 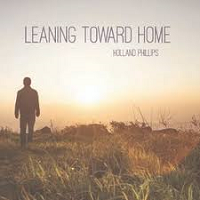 I think what Holland Phillips wants more than anything is for you, the listener, to discover the magic that he did in the music. Your realizations that are found inside the music can be joyous, revealing and mind-expanding. It is what you make it, the choice is yours.